register for events online for $25 a day. Parents are no longer required to call or email to use MCFD event bursaries. At ACT, we hear from many families concerned that their teens with ASD are unprepared to graduate. Academically able students also need help to develop the life skills they need to thrive in higher education and employment. School and home teams are more effective when they consider these issues at 12 rather than 17! 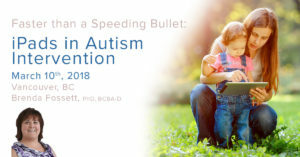 This one day workshop with Dr. Pamela Crooke, who works extensively with able teens and young adults, will provide school teams and parents with a practical approach to helping young people with ASD thrive either in higher education or employment. Since the iPad was first released in 2010, the use of iPads and other tablets have become common learning tool in the educational environment. For individuals with autism and other developmental disabilities, they have been seen as “miracle” devices. However, for these devices to be effective, there is a lot to be considered. This workshop will review a number of skill areas in which the iPad can be a useful instructional tool and/or an aid for daily living. Current research regarding the effectiveness of iPad and other tablet-based applications in a variety of skill areas, including communication, academic, daily living, social and employment skills will be reviewed. Relevant apps will be discussed and/or demonstrated. 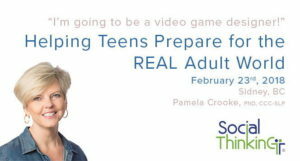 This presentation will address the age range, from young children to adult. It is aimed at those who need considerable support in communication and behaviour. Our phone number and other contact information are unchanged. Our recently re-designed portals to Autism Information and BC Resources are now available. These pages make it easier than ever to discover ACT’s autism resources, community events, and information in multiple languages. Search B.C. Community Resources, find Community Events, look through the Autism Manual and New Diagnosis Hub, discover educational opportunities, and much more. Search the Autism Information Database (AID), browse by subject, find autism information in Chinese and Punjabi, along with dozens of languages in the AID, browse videos in the Online Mental Health and Autism Project, and discover the latest in autism research. This entry was posted in News on February 5, 2018 by ACT.